Top-cocking field stripping pin and a quick-release maintenance pin for easy maintenance on and off the field. 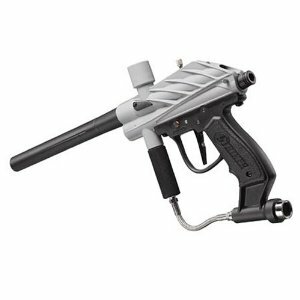 It also features a gas through fore grip that delivers comfort and control for quick, accurate movement of your marker, custom trigger guard with double finger trigger for faster rates of fire, and a custom drop forward that allows for more comfort and reduces the overall profile of the marker and tank. The Liberator also includes a vertical feed port for increased ball feed rate and a custom barrel for increased ball accuracy.